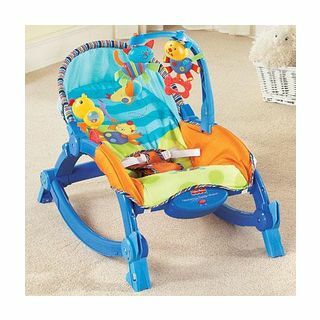 It starts out as an infant seat or rocker with a low-profile frame, very appropriate for newborns. 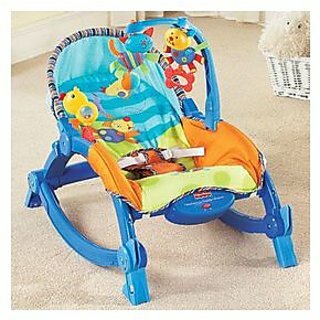 Then, as your child grows, you can easily convert it to an infant seat to add interactive toy play, then make it a toddler rocker. It folds easily and has a built-in handle, so it can go wherever you and baby do! • Versatile seat angles add comfort for different age babies. • As baby bats at overhead and side activities, eye-hand coordination and fine motor skills are being refined. • Rattles offer auditory stimulation. • Bright colors and patterns stimulate baby’s visual sense.